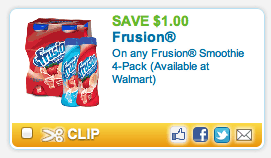 New Dannon Frusion Smoothie Printable Coupon for a Walmart Deal! Visit Coupons.com and look in the Beverages category for a $1 off 1 Dannon Frusion Smoothie coupon*. Print it out and bring it to Walmart to get a nice deal on smoothies! :: Final price: $1.98 or just $0.49 per smoothie! Visit my printable coupon page to find the latest and greatest coupons! Visit Coupons.com and click the LOCAL COUPONS link at the top of the page. Enter zip code 77477 into the zip code box in the upper left corner of the screen (see above image). Click the yellow circle with the white arrow inside it. Click on the COUPONS link at the top of the page to bring you back to the printable manufacturer's coupons. Look for the Dannon Frusion Smoothie coupon under the Beverages category.